How do I save an item or task for use on future invoices? When you’re creating numerous invoices, it’s nice to be able to have all the information you need set up and ready to go. 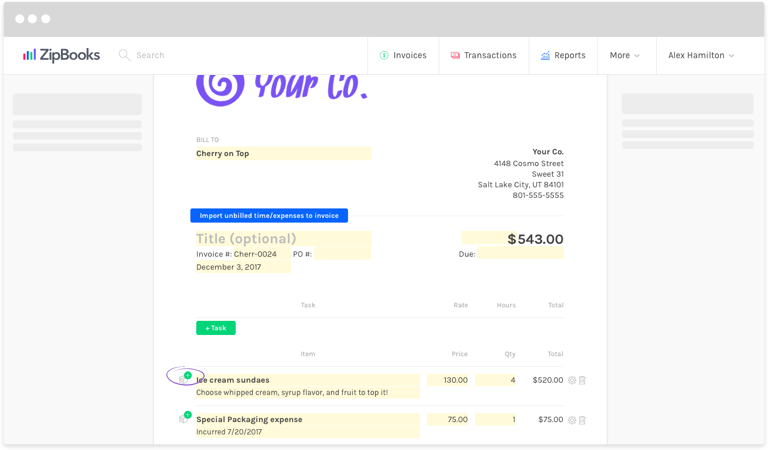 ZipBooks lets you save items for use on invoices, so that you don’t have to type it all in again every time. Log in to ZipBooks and select Invoices from the menu. In the box on the left, click on Items. Click the round green ‘+’ button in the top right. A New Item window will open. Enter the Name, Price and item Type (Invoice or Bill). If you want, you can also add a description, SKU, group, category and any notes. Click the blue Save button. Your item is now saved to your list and you’ll be able to add it to any invoice with one click–create and save as many items as you want! Note: This list of items is for use within your invoices. You can add as many details as you want in order to help you get organized, but this items list will not serve as inventory tracking. While you can add items for recurring reference in invoices and bills, you can not track the quantity of remaining items, etc. 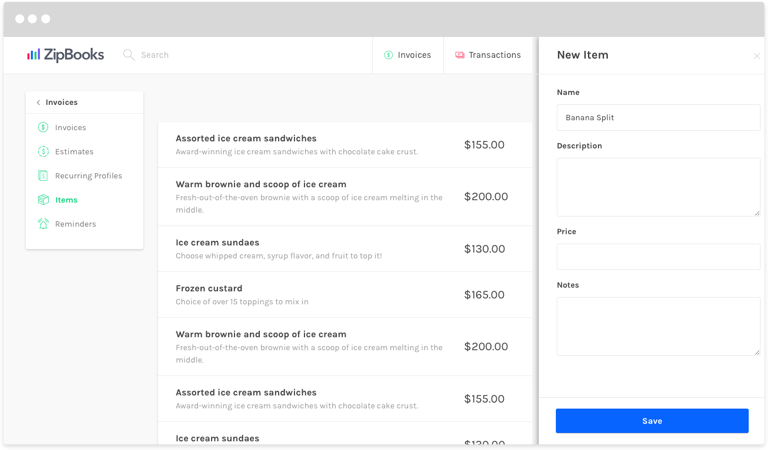 You can also create items and tasks from directly within your invoice and save them for later use. If you’re typing up a line item on an invoice that you know you’ll use again, save it! While creating your invoice, type in a Task or Item in the corresponding field. Add the details that you want saved, like Rate, Price, and Description (Quantity and Hours will generally vary every time you use an item). Click on the box icon with small green ‘+’ button to the left side of the line. Your line item will now appear as part of your saved items list. To see how this works, let’s create an invoice and add some saved items. While still in the invoices section of ZipBooks, click on Invoices in the box on the left. Click the round green ‘+’ button to create a new invoice. Scroll down to the Task or Item section where you’ll add your invoice line items. Click in the Title field and a drop down menu will appear. When you start typing, the list will be narrowed down until only the one you’re looking for remains. Push the down arrow on your keyboard to select it and then push enter, or click on it with your mouse at any time. All of the applicable information that you saved will appear in their respective fields. Do the same for any items you want to add. That’s it! Now you can save a few minutes of your valuable time, every time. How do I bill a customer automatically every month? How do I create a recurring profile from a regular invoice? How do I create a manual payment in my ZipBooks account? How do I track invoice views? How do I change the default information on my invoices and estimates? How do I change the accent color on my invoices and estimates?